The Shapton Naoru Cast Iron Lapping system employs a solid cast iron plate to which you apply Shapton Surfacing Compound and water. The water and abrasive slurry on the flat hard iron surface makes for fast and accurate flattening of water stones. The Naoru System includes a generously sized 250mm x 100mm (9-7/8" x 3-7/8") Cast Iron Lapping Plate, 1/2 lb Coarse Surfacing Compound, and 1/2 lb Medium Surfacing Compound. To use the Naoru Lapping System, apply water to the cast iron plate. The plate should not be overflowing, but there should be water in all the grooves. Then sprinkle the appropriate grit of Shapton Surfacing Compound onto the plate in 3 or 4 places. Spread the abrasive around by hand, and you are set to flatten. Use a pencil to make reference lines on the surface of the water stone to be flattened, and then make sure it has plenty of water in it. Shapton stones should be soaked for 2-3 minutes prior to flattening on the Naoru System. Other brands of stone should be soaked until saturated. Place the water stone pencil marks down on the cast iron plate and move it back and forth, then diagonally to the right and to the left. Pause to check every several strokes to gauge your progress. When the pencil marks on the face of the water stone have gone, it is flat. Always wash and dry the cast iron thoroughly after use. Also clean the Naoru Plate thoroughly with water before changing to a new grit of Surfacing Compound. For stones 25 microns/500 grit to 4 microns/3000grit Use Medium Surfacing Compound. Coarse Compound can be used for initial flattening if required, but Medium should be used to finish the stone. 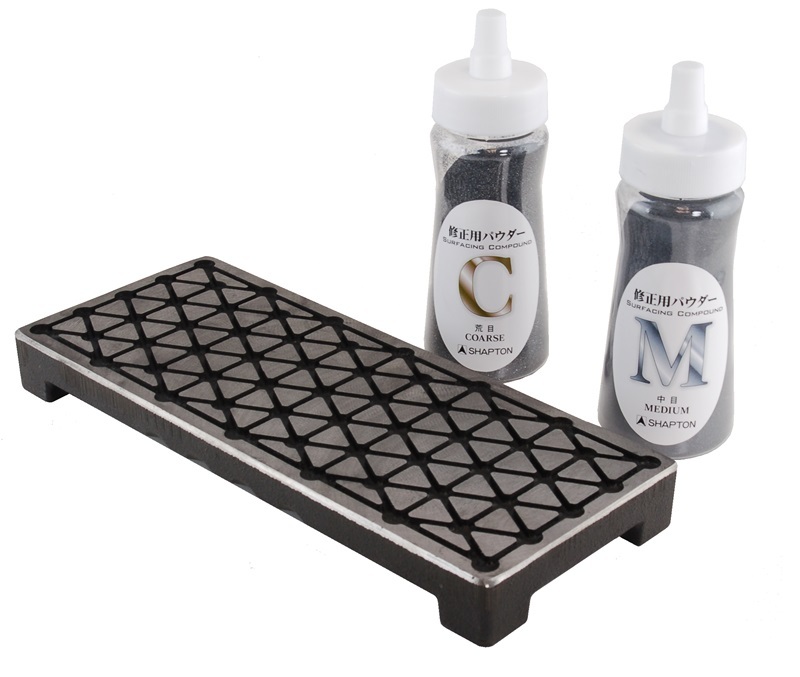 For Stones of 3 microns/4000 grit or finer use Fine Surfacing Compound (sold separately). Medium Compound can be used for initial flattening if required, but Fine should be used to finish the stone. Containers of Shapton Fine Surfacing Compound are sold separately. Replacement containers of the Coarse Surfacing Compound and the Medium Surfacing Compound are available. The Shapton Naoru Cast Iron Lapping System can be used to flatten water stones of almost any type from any manufacturer. However, stones with diamond abrasive should not be flattened on it. 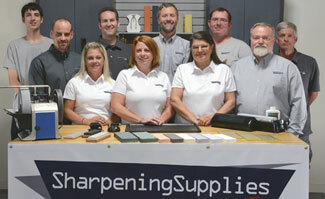 Sharpening Supplies is an authorized retailer of Shapton Stones. Shapton Products are made in Japan.